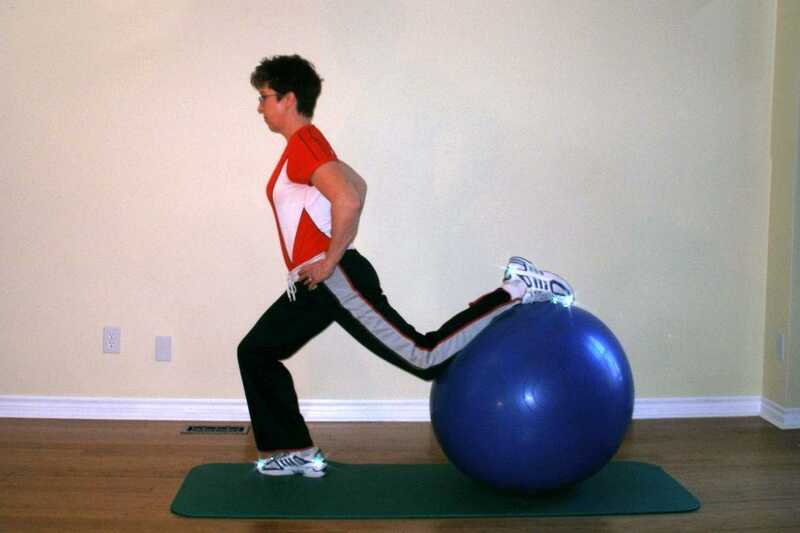 Start by standing with your back to the exercise ball. Raise one foot back and place it on the ball. Put your hands on your hips. Abdominal muscles should be engaged to maintain your lower back in a nice neutral position and a level pelvis. Lower yourself, if you can, until your thigh is horizontal, or you feel a stretch in the rear leg, which ever comes first. Raise yourself back up to the starting position slowly. To avoid knee injury, your weight bearing knee should not move past your toes. If it does, you need to move further away from the ball. Another key to good alignment is to make sure when you look down your knee is lined up with your second toe. Don't let your knee sway in or out. Keep your movements slow and controlled. This isn't about speed or power. It's about controlling your overall alignment. Above all, if you have any discomfort stop and find a more rudimentary exercise ball exercise. For more of a challenge to your balance, try this exercise ball exercise with your eyes closed. To further challenge strength, hold dumbbells as you lunge. This is probably one of the most functional exercise ball exercises. 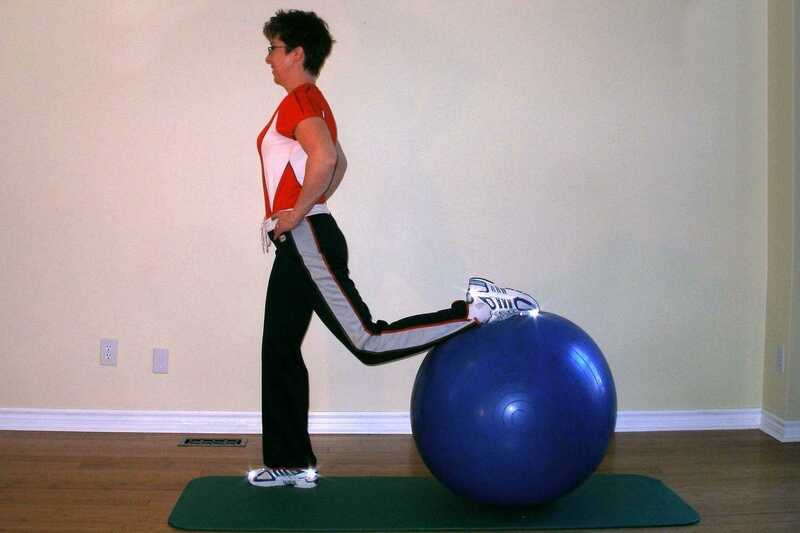 This ball exercise works the quadriceps, hamstrings, gluteal muscles together with the core stabilizing muscles. It also helps balance. This ball exercise also helps with dynamic flexibility in the hip, knee and ankle joints, and helps those that require rapid acceleration and deceleration movements such as tennis players, and soccer players. Maintaining stability on one leg is necessary for many contact sports such as football, rugby, hockey, etc. Repeat this movement 6 times on each leg. Repeat this movement 10 times on each leg. Repeat this movement 15 times on each leg.